Last year saw The Last Poets celebrate their 50-year anniversary with the righteous, politically-charged poetic record, "Understand What Black Is". Now to continue the party, Brighton production-maestro Prince Fatty has reworked the album with a fresh twist and blend of smooth, dub-delights. Set to land on the 29th March, with first single "Rain Of Terror" leading the way on the 22nd March, the revolution marches on - this is "Understand What Dub Is". After Prince Fatty's involvement in the production of the original project, he was the perfect person to help update the record with five decades of experience for a new audience to enjoy. The ten tracks of "Understand What Black Is" depict a relevant, historical philosophy of identity and race that has followed The Poets over the last 50 years. Since the origins of the civil rights movements back in the late 60's, Abiodun Oyewole and Umar Bin Hassan (two of the longest-standing group members) have provided social commentaries and a voice to African-American consciousness that has now been heard on a global scale. Their raps, exploitations and insights quickly evolved into the origins of hip-hop in Harlem, New York back in 1968, and now in 2019 they continue to voice their dedication to the cause with the backing of slick rock-steady infused beats to keep things moving. Having had their work sampled by the likes of NWA, Dr Dre, Kanye West, Snoop Dogg and countless others is just a testament to the timeless sounds and prophecy they have created, and now Prince Fatty has stepped up to put his stamp on it. Prince Fatty's ever-reliable work gives "Understand What Black Is" another lease of life as he maintains an undeniably slick groove throughout. 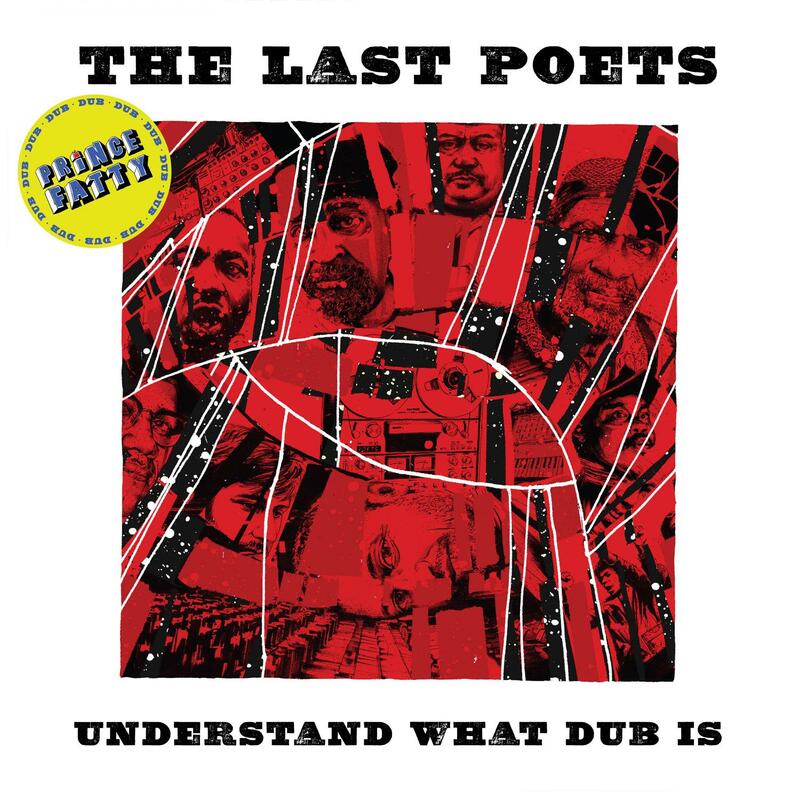 Both therapeutic and warm, the soulful rhythms of "Understand What Dub Is" provide the perfect platform for The Last Poets to delve into everything from Trump's inauguration, nods to Biggie Smalls and respect to Prince. The calm, collective and downright thought-provoking words go hand-in-hand with the roots-driven reggae medleys with ease - this is dub in its rawest form. Not only do these songs explore personal struggles and individual endeavours, they also represent a collective of deprived aspects of humanity and socialism, that perhaps now need to be pointed out more than ever. Although there is a variation of sound, the overlying topics remain a constant - it is time to "Understand What Black Is" once more. A Nostalgia 77 & Prince Fatty Production. All tracks Produced by Benedic Lamdin & Mike Pelanconi. All tracks written by Umar Bin Hassan (ASCAP 335581655), Abiodun Oyowele (ASCAP 128761658), Benedic Lamdin, Mike Pelanconi, Dub Judah, Winston "Horseman" Williams & Riaan Vosloo. Mike Pelanconi Published by Because Music. Umar Bin Hassan, Abiodun Oyowele, Benedic Lamdin, Dub Judah, Winston "Horseman" Williams & Riaan Vosloo Published by Copyright Control. Rhythms recorded at The Ironworks, Brighton. Horns Recorded at the Fish Factory, London. All arrangements by Riaan Vosloo. Horns conducted by Riaan Vosloo. Vocals recorded in NYC at Moon Studios & at 68 Jay St. Engineers: Eber Pinheiro & Sean Amery. Mixed at Evergreen Studios, London. Mastered by Frank Merritt at The Carvery, Leyton, London. Artwork by New Analog Design (www.new-analog.net). Layout by Rich Elson. Thanks to Lisa Mead at Apples And Snakes for helping out. I want to thank the Creator of all the Worlds and my ancestors for allowing me to stay around to get this done. Thank you to my mother - Mattie Mae Dawson, my niece Juanita, my sister Anita and my children Pharoah, Obadele, Aina, Ebon, Sowande, Donjiman and Ademola. I would also like to thank all the mother's of my children – Biji, Ayisha, Pepsi, Nayo and Kathy - they did the work. Thanks also to Donn Babatunde, the heartbeat of the group. RAIN OF TERROR: Drums - Winston "Horseman" Williams. Bass - Dub Judah. Guitar - Kashta Menilek Tafari & Graham Coxon. Piano & Hammond - Carlton "Bubblers" Ogilvie. Piano - Ross Stanley. Synthesizers & Rhodes - Matthew Bourne. Percussion - Lenny Edwards & Afla Sackey. Trumpet - Alex Bonney. Flute - Gareth Lockrane. Clarinet - Lluis Mather. Bass Clarinet - George Crowley. Tenor Saxophone - James Allsopp. Baritone - Sam Rapley. Trombone - Trevor Mires, Tom White & Adrian Hallowell. Additional vocals - Shniece Mcmenamin. Backing Vocals - John "Segs" Jennings. WE MUST BE SACRED: Drums - Winston "Horseman" Williams. Bass - Dub Judah. Guitar - Kashta Menilek Tafari. Piano & Hammond - Carlton "Bubblers" Ogilvie. Percusion - Lenny Edwards & Afla Sackey. Bass Clarinet - James Allsopp. Additional vocals - Shniece Mcmenamin. UNDERSTAND WHAT BLACK IS / HOW MANY BULLETS / WHAT I WANT TO SEE / CERTAIN IMAGES: Drums - Winston "Horseman" Williams. Bass - Dub Judah. Guitar - Kashta Menilek Tafari. Piano & Hammond - Carlton "Bubblers" Ogilvie. Piano - Ross Stanley. Percussion - Lenny Edwards & Afla Sackey. Trumpet - Alex Bonney. Flute - Gareth Lockrane. Clarinet - Lluis Mather. Bass Clarinet - George Crowley. Tenor Saxophone - James Allsopp. Baritone - Sam Rapley. Trombones - Trevor Mires, Tom White & Adrian Hallowell. THE MUSIC: Drums - Winston "Horseman" Williams. Bass - Dub Judah. Guitar - Kashta Menilek Tafari. Piano & Hammond - Carlton "Bubblers" Ogilvie. Piano - Ross Stanley. Percussion - Lenny Edwards & Afla Sackey. Trumpet - Percy Purseglove & Rory Simmons. Flute - Gareth Lockrane. Alto & Baritone - Jason Yarde. Tuba - Andy Grappy. Tenor Saxophone - James Allsopp. Trombone - Trevor Mires. NORTH, EAST, WEST, SOUTH: Drums - Winston "Horseman" Williams. Bass - Dub Judah. Guitar - Kashta Menilek Tafari. Piano & Hammond - Carlton "Bubblers" Ogilvie. Piano - Ross Stanley. Percussion - Lenny Edwards & Afla Sackey. Trumpet - Percy Purseglove & Rory Simmons. Flute - Gareth Lockrane. Alto & Baritone - Jason Yarde. Tuba - Andy Grappy. Tenor Saxophone - James Allsopp. Trombone - Trevor Mires.